Aanin! If you didn't know that means “hello” in Anishinaabemowin, then you may learn a few things from a new exhibit on the ground floor of Robarts Library. Before entering the stacks, library visitors can see the work of First Nations artists and Indigenous materials on display until April 27, all of which promote local Indigenous languages including Kanien'kéha (Mohawk), Anishinaabemowin (Ojibwe), Wendat and Onöndowa'ga:’ gawë:nö’ (Seneca). The collection ranges from educational literature from the library's shelves, like a grammar of the Seneca language, to collaborative art pieces like a canvas showing three medicine wheels and a Mohawk tree of peace. Jenny Blackbird, a multidisciplinary artist, dancer and musician who works for the Centre for Indigenous Studies at the University of Toronto, helped put together the installation. She says she wants it to inspire visitors, particularly students, to take a greater interest in Indigenous languages. Under professors Ryan DeCaire and Alex McKay, the centre is helping keep Indigenous languages alive. 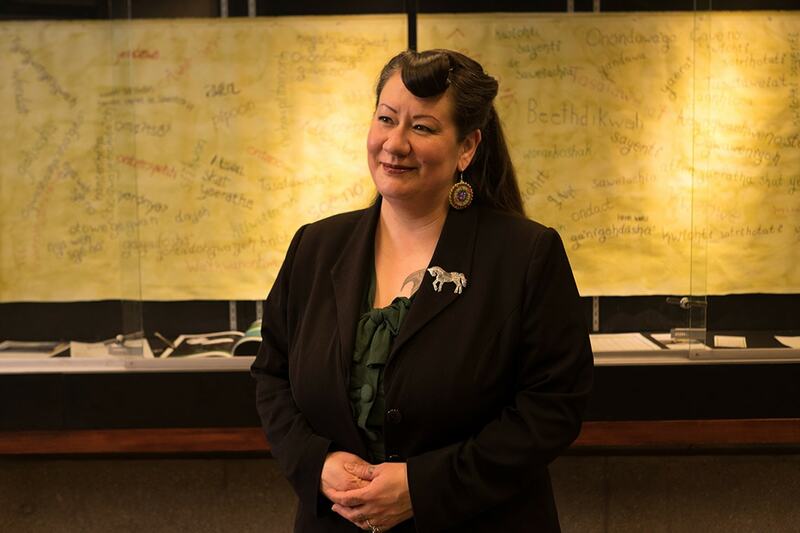 DeCaire, an assistant professor of linguistics who is Mohawk from Wáhta Kanien’kehá:ka Territory, learned the Mohawk language as an adult after learning it was endangered. As few as 100 fluent speakers remain. He teaches full-year courses on Kanien'kéha. And McKay, an associate professor in Indigenous studies who is Anishinaabe, leads the Anishinaabemowin program and teaches classes on the language, culture and legends. Those who visit the exhibit can read more about their work from press clippings on display, and see other reports about the street sign project involving U of T's Hayden King and Susan Blight. In 2013, the artists and activists began pasting Anishinaabe words over signs for streets like Spadina (Ishpadeena) to call attention to their Indigenous heritage. The intiative was part of a larger project, called Ogimaa Mikana, to increase the presence of Indigenous peoples in signage across the city. Some of Blight's posters for her If the Walls Could Talk exhibit at Hart House last year are on display at Robarts. There is also work by Jay Odjick, an Algonquin artist and writer, who is known for sharing Indigenous vocabulary lessons over social media. His Algonquin word-of-the-day charts show how to say and pronounce basic words, from apple to dog and more. Sara McDowell, a reference librarian at U of T who helped organize the exhibit, says the installation chimes with the commitments made by the university toward reconciliation. “As non-Indigenous people, we're responsible for language loss through the residential school system and other colonial policies. It is our responsibility to bring these languages back, under Indigenous direction,” she says. Others involved with organizing the exhibit were: Assistant Professor Jill Carter, artist Catherine Tammaro, Jennifer Toews, and Desmond Wong. Elders, language teachers and community members were consulted.